Central Piedmont Master Naturalists helped youth get outdoors in nature through a Junior Naturalist club. Right in the middle of the Heartland of Virginia is the central piedmont. This area includes the counties of Cumberland, Buckingham, Prince Edward, Amelia, Charlotte. We might also be convenient to anyone living further to the south, southwest or southeast as well. The beauty of the central piedmont is that it is an area that has a complicated history of human use and exploitation. It is also an area rich in examples of how the earth can heal itself with our help. Plant and animal species are rediscovered here. Training for the Virginia Vernal Pool Project (the subject of a webinar recorded on October 24, 2014) will be held on April 1, 2017, at Bear Creek Hall at Bear Creek Lake State Park in Cumberland County. The training, which will run from 10 am to 2 pm, includes classroom lecture and a trip to explore a nearby vernal pool. 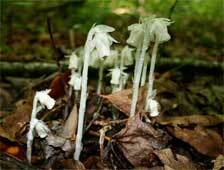 There are several in the surrounding Cumberland State Forest. Anne Wright, Director, VCU Rice Rivers Center Outreach Education, and Susan Watson, terrestrial wildlife biologist with the Department of Game and Inland Fisheries, will conduct the training which covers species identification, sanitation protocols, and permit requirements. It's bird house building time again at Bear Creek Lake State Park! Saturday February 18, 2017 at 10:00 a.m. at Bear Creek Hall. This annual community event will help you prepare for the upcoming s​pring season. Bluebirds will soon be staking out their territories and choosing a home to raise their young. The Central Piedmont Virginia Master Naturalists, in partnership with Bear Creek Lake State Park, welcomes you to learn about bluebird habitat and how to attract bluebirds to your yard, as well as how to maintain and predator-proof your houses. The house kits are made of high quality cedar and are ready to assemble. There will be some tools on hand, but feel free to bring your own Phillips head screwdriver. This is a great activity for the whole family. A parent or responsible adult should accompany children. Pre-registration is required. There will be a limited number of kits available and couples/families may reserve a maximum of two kits. The workshop is free, but a donation of $10.00/kit will be accepted at the workshop. Registration may be made by contacting JoAnn Jones at 434-547-9180 or joajonz1@gmail.com. The Central Piedmont Virginia Master Naturalist chapter is pleased to sponsor a community program on “Snakes in the Heart of Virginia”. The presenter, Mike Clifford, has an extensive background in this area and will share specific information related to a variety of live snakes! The Virginia Piedmont is home to over twenty species of native snakes, most of which are harmless to humans and pets. Some are brightly colored, while others are masters of camouflage. Some climb high in trees, while others live underground. Many help us to control rodent and invertebrate pests. All are important members of our natural ecosystems. Snakes generate curiosity, fear, and amazement. For folks of all ages, this herpetological presentation will use colorful slides, live specimens, replicas, and other visuals to help the audience understand, recognize, and appreciate these misunderstood members of our natural fauna. Please join us for this wonderful opportunity to learn about Central Piedmont’s snakes from our local expert! Mike will have copies of his book available and refreshments will be served. The presenter, Mike Clifford, is the educational committee chairman and past-president of the Virginia Herpetological Society. He co-authored the book Snakes of Virginia and has worked as Virginia Tech Extension 4-H Agent in Amelia and Nottoway counties for 32 years. Mike continues to work with the Virginia 4-H Natural Resources & Environmental Education Curriculum programs, particularly with wildlife, GPS, and shooting education programs. He also operates Frog Holler' Outdoor Education, an educational service that provides workshops for teachers, natural resource professionals, youth groups, and other audiences. Mike and his wife Pat live at Frog Holler' in rural Amelia county, along with their several pets and assorted wild creatures. He can be contacted at mjc4h@vt.edu. The CPVMN Outreach Committee focused its efforts in 2014 on developing a variety of displays to showcase chapter projects and to educate the public in selected areas. 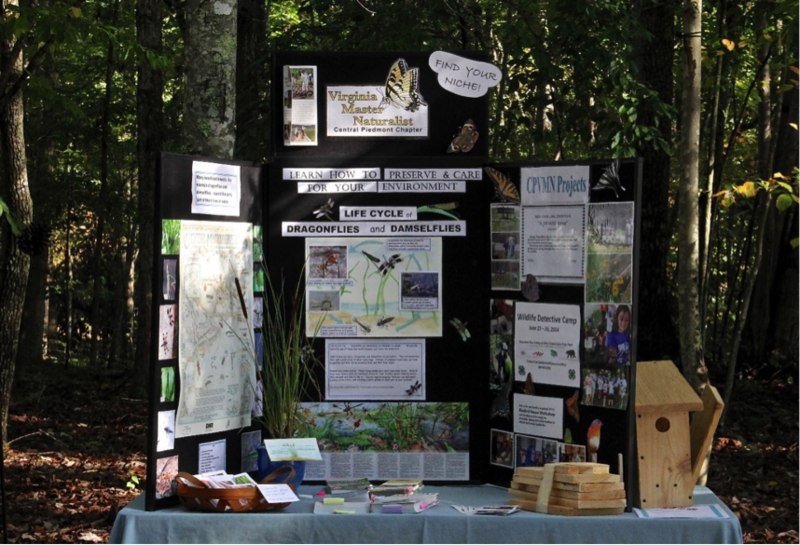 We chose local festivals, such as Cumberland County’s Patriot Day, as our primary venues We also displayed in the September Heart of Virginia Master Gardener Symposium to share information about pollinators, dragonflies, wildflowers, bluebirds, and our chapter’s young naturalist day camp. At the annual Five County Fair held in Farmville, VA, different chapter display won First Prize! In 2012 MN members began planning with Cumberland County 4-H and Bear Creek Lake State Park staff to develop a young naturalist day camp for 9-13 year olds. In 2013 and 2014 a combined total of 30 youngsters enrolled in our camps to receive exposure and instruction relating to mammals, reptiles and amphibians, insects, owls and other birds, fishing and canoeing, dip-netting for critters, tracking, and keeping a naturalist field journal. We feel the success of the camp can be measured by camper feedback, which has been overwhelmingly positive! In September and October, 2014, several chapter members met with Virginia State Parks staff to participate in a Japanese Stilt Grass Removal project at Bear Creek Lake State Park. They were issued cards identifying them as members of the Stiltgrass Removal Squad (or SRS). They certainly made a dent in defending our public lands. Central Piedmont members look forward to more partnerships and presentations in 2015! Central Piedmont chapter members volunteer at locations such as Cumberland State Forest and Bear Creek Lake State Park. They conduct educational programs, citizen science projects, and stewardship efforts at these and other locations.